Hidalgo County allows shippers to securely order specialized overweight permits online. The permits cover travel over the Hidalgo County roads listed below for vehicles weighing no more than the Mexican Legal Weight Limit or 125,000 lbs. For a more detailed explanation, see below. This site is temporarily down for maintenance. We appologize for the inconvenience. We are experiencing issues with credit card processing at the moment. Permits may still be ordered using Escrow Accounts online. We apologize for the inconvenience and hope to have the credit card payment method back up shortly. PHARR - The Texas Department of Transportation announces that an overnight closure of the approach and departure of Interstate 69C (US 281) towards westbound Interstate 2 (US 83) will be taking place tonight from 9:00PM to 6:00AM in the Pharr/McAllen area (Pharr interchange). IOC Company LLC, a TxDOT contractor will be milling and overlaying the approach and departure side for the Sugar Road overpass in the above limits. Drivers are advised to take alternate routes. (1) U.S. Highway 281 between its intersection with Pharr-Reynosa International Bridge and its intersection with State Highway 336. (2) State Highway 336 between its intersection with U.S. Highway 281 and its intersection with Farm-to-Market Road 1016. (3) Farm-to-Market Road 1016 between its intersection with State Highway 336 and its intersection with Trinity Road. (4) Trinity Road between its intersection with Farm-to-Market Road 1016 and its intersection with Farm-to-Market Road 396. (5) Farm-to-Market Road 396 between its intersection with Trinity Road and its intersection with the Anzalduas International Bridge. (6) Farm-to-Market Road 2061 between its intersection with Farm-to-Market Road 3072 and its intersection with U.S. Highway 281. (7) U.S. Highway 281 between its intersection with the Pharr-Reynosa International Bridge and its intersection with Spur 29. (8) Spur 29 between its intersection with U.S.Highway 281 and its intersection with Doffin Canal Road. (9) Doffin Canal Road between its intersection with the Pharr-Reynosa International Bridge and its intersection with Spur 29. (10) FM 2557 (Stewart Road) from US 281/Military Highway to Interstate 2 (US 83). (11) FM 3072 (Dicker Road) from Veterans Boulevard ('I' Road) to Cesar Chavez Road. 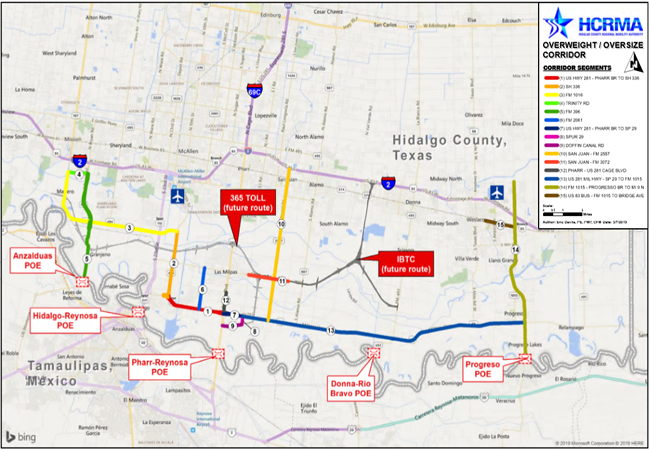 (12) Route 12: US 281 (Cage Boulevard) from US 281/Military Highway to Anaya Road. (13) US 281/Military Highway from Spur 29 to FM 1015. (14) Farm to Market 1015 – Progresso International Bridge to Mile 9 North. (15) US 83 Business – Farm to Market 1015 to Pleasantview Drive. The gross weight of cargo and equipment shall not exceed the allowable permittable axle load, the Mexican Legal Weight Limit or 125,000 lbs, whichever is less, and the dimensions of the load and vehicle shall not exceed 12' wide, 15'6" high, or 110' long. Login below. If you do not have an account, sign up here. Click here to retrieve your login information. Click on the map above to view larger PDF version.